Release Date: June 15th, 2007 (Quad Cinema) by THINKfilm. BASIC PREMISE: A documentary about the history of the Israeli-Palestinian conflict. 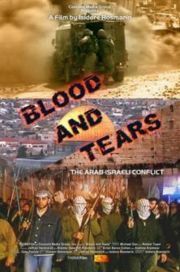 ENTERTAINMENT VALUE: Blood and Tears tackles the very timely topic of the Israeli-Palestinian conflict in an over-simplistic, rushed way. It wastes too much time trying to define obvious terms, such as “Judaism”, “Christianity”, “Muslim”, and then repeats the fact that there has been struggles between the Israelis and Palestinians, who don’t just want some of Israel for themselves, but all of it. Anyone who has watched the news over the past few years should already know that Hamas, a Palestinian-Islamic movement, has used suicide bombs throughout Israel. Director Isidore Rosmarin includes some interviews with ex-Prime Minister Ehud Barak, Shimon Peres and Abdel Azis al-Rantissi, the head of the Hamas who was assassinated. None of these interviews reveal anything new or surprising for those already familiar with the Israeli-Palestinian conflict. Rosmarin uses too many explanatory texts which belong in a middle school textbook without enough interpretation. The recent documentary Six Days did a better job of getting to the source of the conflict and providing detailed explanations, while Blood and Tears merely gives the simplistic Reader’s Digest version in just 73 minutes, not nearly long enough given such an important topic. SPIRITUAL VALUE: None, other than the obvious notion that peace is more productive than war/violence. INSULT TO YOUR INTELLIGENCE: Over-simplistic, repetitive and not enough insight interpretation of the facts. IN A NUTSHELL: A timely issue with an important message, but over-simplistic, repetitive and lacking insight/interpretation.